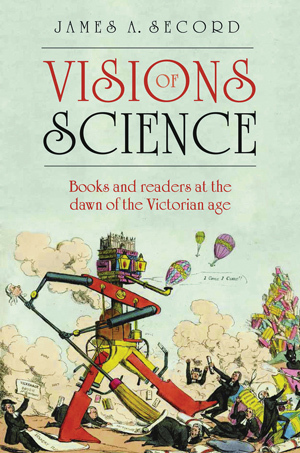 My Christmas gift this year was James A. Secord’s recent Visions of Science: Books and Readers at the Dawn of the Victorian Age (2014). After reading Secord’s magisterial Victorian Sensation: The Extraordinary Publication, Reception, and Secret Authorship of Vestiges of the Natural History of Creation (2000) earlier in the year, I have looked forward to Secord’s next big book. And Visions is a big book, not so much in page number (a mere 306, including endnotes, whereas Victorian Sensation was a massive 624) as in topic. Secord focuses on a series of remarkable books published in the early decades of nineteenth-century Britain. 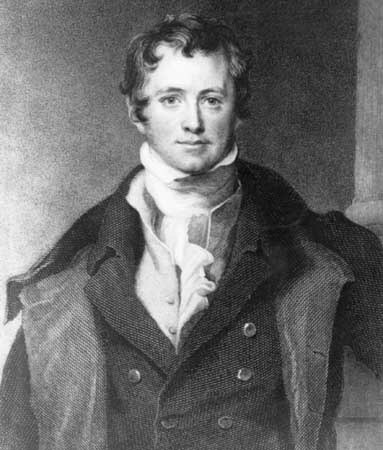 He discusses seven in total: Humphry Davy’s (1778-1829) Consolations in Travel (1830), Charles Babbage’s (1791-1871) Reflections on the Decline of Science in England (1830), John Herschel’s (1792-1871) Preliminary Discourse on the Study of Natural Philosophy (1831), Mary Somerville’s (1780-1872) On the Connexion of the Physical Sciences (1834), Charles Lyell’s (1797-1875) Principles of Geology (1830-33), George Combe’s (1788-1858) Constitution of Man (1828), and Thomas Carlye’s (1795-1881) Sartor Resartus (1836). I have read all but Somerville’s On the Connexion this past year in my research, so Secord’s insights on these works is a much welcomed aid. Secord sets up his project with a short introduction. Modern science emerged in Britain within a Christian atmosphere of apocalyptic and millennial ideas and hopes. But at the same time, Secord writes, “there was a sense of limitless possibility through projections of the future economy based on machines.” These utopian hopes were of course embodied within the new science. There was a danger in the new science, however. As Secord notes, “Paris was the scientific capital of the world in the 1820s.” But in the British mind, French science was associated with the naturalism or materialism of the philosophes. More importantly, concerns over the new science was directly associated with the shock of the French Revolution. Science had to be domesticated and disassociated from anything that smacked of the French, both from its “godless libertarianism” and its guillotines. Secord’s first chapter deals with Davy’s interesting Consolations in Travel. Davy was a well-known and well-regarded Cornish chemist, inventor, and president of the Royal Society. Davy’s book is constructed as a dialogue between Onuphrio (a liberal aristocrat), Ambrosio (a liberal Roman Catholic), Eubathes (a physiologist and naturalist), Philaethes (the narrator), and a “Unknown” stranger. The dialogue partners discuss the laws of history, divine progression, happiness, and the enlightenment of society. After the men retire, Philaethes, the narrator, experiences a vision. In the vision Philaethes is guided by “Genius” through a journey on the history of humanity. Genius explains to him how civilization has progressed from the barbarous to higher states of being. This has been achieved in two ways. First, and most recently, by the invention of the printing press. “I looked, and saw,” says Philaethes, “that in the place of the rolls of papyrus libraries were no filled with books. ‘Behold,’ the Genius said, ‘the printing press; by the invention of Faust the productions of genius are, as it were, made imperishable, capable of indefinite multiplication, and rendered an inalienable heritage of the human mind. By this art, apparently so humble, the progress of society is secured.” Second, the progress of civilization has been accomplished by great men. “It sometimes happens,” Genius discloses to Philaethes, “that a gigantic mind possess supreme power and rises superior to the age in which he is born…but such instances are very rare; and, in general, it is neither amongst sovereigns nor the higher classes of society, that the great improvers or benefactors of mankind are to be found.” Davy than adumbrates a list of such men: “Anaxagoras, Archimedes, Roger Bacon, Galileo Gallilei, in their deaths or their imprisonments, offer instances of this kind, and nothing can be more striking than what appears to have been the ingratitude of men towards their greatest benefactors.” Genius goes on to reveal the laws of history, society, and spiritual natures to Philaethes. In another dialogue, while the characters are exploring the ruins of the temples of Paestum, they encounter an “Unknown” stranger who introduces the topic of geology to their discussions, a touchy subject for both British scientists and religious believers at the time. Ambrosio believes in a single creation, but is not a scriptural literalist. Onuphrio promotes the cyclical geological theory of James Hutton. What all speakers agree on, however, is that there is no evidence for the transmutation of species, a position advocated by more radical thinkers Erasmus Darwin and Jean-Baptiste Lamarck. Philalethes argues that “all philosophy must begin from a foundation of faith, and that this can be validated not only by studying God’s works, but also by drawing parallels between the infinite mind of the divine and the mind of man.” It is interesting how the revelation of Scripture is replaced by a revelation of nature, or natural theology, in Davy’s dialogue. I become, however, every day more sceptical as to the use of making or endeavoring to make the people philosophers. Happiness is the great object of existence, and knowledge is a good only so far as it promotes happiness; few persons ever attain the Socratic degree of knowledge to know their entire ignorance, and scepticism and discontent are the usual unripe fruits of this tree—the only fruits which the people can gather; but I will say no more, knowing how unpopular my arguments will be; yet I could say much.